Why include parachute activities in your program? Regular parachute use can increase perception abilities. Social and physical benefits are considerable too. The form of play is non-competitive and cooperative. 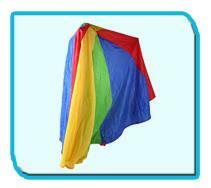 Rhythm and language activities can also be involved in many parachute games. Parachute play is fun and entertaining for adults and children alike. This out of the ordinary activity simply has a touch of magic to it. We suggest the purchase of a parachute made of light nylon with bold colors. It is equipped with eight sturdy reinforced handles. It measures 3.5 meters and is sold with a nylon carrying case ideal for storage. You can purchase it on our online store. Popcorn-Make small waves with the parachute by gently shaking it. Place tennis balls on the parachute and make them bounce like popcorn. Rolling balls-Place a ball on the parachute. Have children work together to get the ball to go through the hole in the center of the parachute. One-handed race-Have children hold the parachute with one hand and stretch their other arm out to maintain balance. Run around in circles in one direction, then change hands and do the same in the opposite direction. Music can be used to signal that it is time to change direction. For example, children can switch hands every time the music stops. Making waves-Children hold the parachute with both hands and move it up and down to create small or big waves. Parachute lifts-Children raise the parachute high over their heads and lower it. Have them notice the sound of the breeze which travels under the parachute. This can be repeated at different speeds to create various sounds. This activity can also lead to the "mushroom". Children hold the parachute at their waist level and, on the count of three, lift the parachute high above their heads and then quickly crouch down holding the parachute tightly behind them. This will create a mushroom effect. Cat game-Children lift the parachute high above their heads. Have one child cross over to the other side of the parachute (running, crawling, hopping, etc.) before the parachute comes down to touch him. Pizza-Children tightly stretch out the parachute and hold it at arms length above their heads. Have them rotate to the left or to the right and then toss the parachute in the air. Parachute race-Children make waves with the parachute while one child tries to run on it without falling down. The length of time for each turn can be limited by having children sing a song. At the end of the song, it is another child's turn.